Today, modern authoritarians are reviving such behavior, suddenly and covertly snatching people, including well-known figures and high-ranking officials, to be detained or worse. 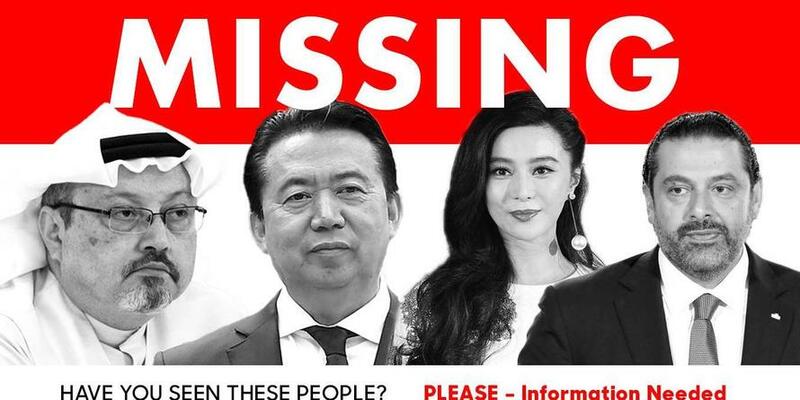 In many cases, the “vanished” do eventually resurface, but with an apparently transformed perspective on their past work or the government that detained them. Here, China and Saudi Arabia stand out – though they are by no means alone – for orchestrating a series of increasingly brazen abductions or vanishings of their detractors. Yet Chinese President Xi Jinping was willing simply to throw away that public relations victory. Eventually, it was announced that Meng had been detained and was being investigated for bribery. The decision, justified as part of China’s ongoing anti-corruption campaign – an endeavor that critics say is a cover for eliminating political figures disloyal to Xi – revealed an utter lack of regard, or even contempt, for world opinion. Finally, Fan resurfaced earlier this month, issuing a groveling apology for having evaded taxes, for which she will now face massive fines. Tellingly, her statement included plenty of praise for the Communist Party of China, which she credited for her success as an actress. It was all depressingly familiar, recalling as it did the pathetic confessions of Nikolai Bukharin, the editor of the Communist Party newspaper Pravda, and others during Stalin’s purges. Saudi Arabia has also executed a series of high-profile, politically motivated kidnappings. Last year, Saudi Arabia’s Crown Prince Mohammed bin Salman ordered the detention of Lebanese Prime Minister Saad Hariri, who was on an official visit to Riyadh. Hariri was isolated even from his bodyguards and forced to resign. Weeks later, and evidently enlightened to his captors’ satisfaction, he was permitted to return to Lebanon and resume his role as its elected leader. Then, last week, Jamal Khashoggi, an exiled Saudi journalist, vanished after entering Saudi Arabia’s consulate in Istanbul to obtain a document confirming his divorce, so that he could marry a Turkish woman the next day. His fiancée waited at the consulate’s entrance; he never reemerged. According to the Turkish authorities, two teams, totaling 15 people, flew from Riyadh to Istanbul on the day of Khashoggi’s appointment and left within hours. This, too, is grimly familiar to Russians: Stalin also had special assassination teams, one of which carried out the murder in Mexico of his archenemy, Leon Trotsky. Unsurprisingly, the Saudis have denied any wrongdoing. Khashoggi, they claim, left the consulate.